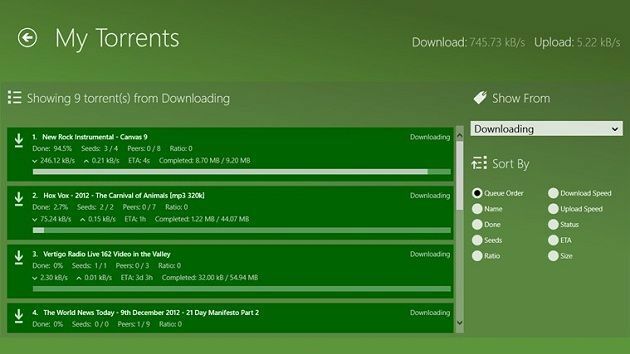 If you want to manage downloads remotely in Windows, uTorrent Client is one of the best tools to use. uTorrent is probably the world’s best known and used client for downloading torrent files. Its popularity is mainly due to its low resource footprint, ease of use and very simple, but effective features. Over the past years, we’ve seen this program rise from anonymity to world know name, and now it comes to Windows 8 and Windows 10, as a Modern UI app, downloadable from the Windows Store. Although the app is not free of charge as other uTorrent products, you still have the option to try it out for free, just to get a taste of what it can do and how it can be used. This tool is especially useful when you are not at home and you want check the state of your downloading/uploading torrents. The app is very similar both in looks and appearance to the uTorrent Remote app, available for Android. Although it is not a proper downloading app, as you would have expected, it allows you to add torrents to your download queue and manage existing torrents. Note: The information that is required in this field is from the target computer. After supplying the information required, you will have to input the login credentials and you are done. Apart from seeing the torrent information, you can add or remove torrents from the list at any time. This tool is very useful when you leave your torrent client to download and you go about your business, and because it the app is so simple to use and its UI is so intuitive, we think that it is a great addition to your Windows 8, Windows 10 machine. uTorrent team has developed a special browser extension for users to manage their torrents remotely. Chrome, Firefox, Edge and IE support this tool. However, it is mostly good to monitor your torrents but is a little tricky to search and start downloading torrents because of tool’s code integrated into browser’s engine. If you consider setting up uTorrent on your Windows 10 PC, feel free to check our review-guide about uTorrent for Windows 8, 10 versions. The desktop app for Windows 10 has been released and works perfectly. It still has the same main features as the previous version, but it also allows you to run it in the browser. The developers said that monetizing their product is the main direction of the app development, and they will work a lot the mini-toolbars from the app. What is not clear until now is – did the developers referred to a full browser-compatible version or a browser-like version (which we have at this moment and works fine)? Keep an eye on our news as we will let you know when it’ll be released. Editor’s Note: This post was originally published in December 2012 and has been since revamped and updated for freshness, accuracy, and comprehensiveness. We want to be sure that our list has the best products that will fit your needs.